Hola Amigas. Welcome to the 12th SUDSOL Blog Tour. What better way to see NEW items from the 2013-2014 Catalog. I hope you have grabbed your coffee and treat. Sit back and relax for a GREAT Journey with my SUDSOL and Stampin' UP! Sisters. 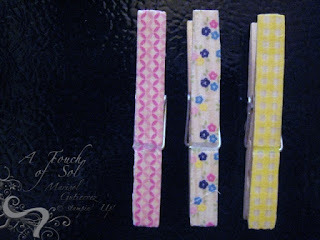 Today I am sharing with you fun projects I created with our NEW Washi Tape. I wasn't sure what to do with it at first but OH, MY! I LOVE IT! My first project was to make new magnets for my new fridge. 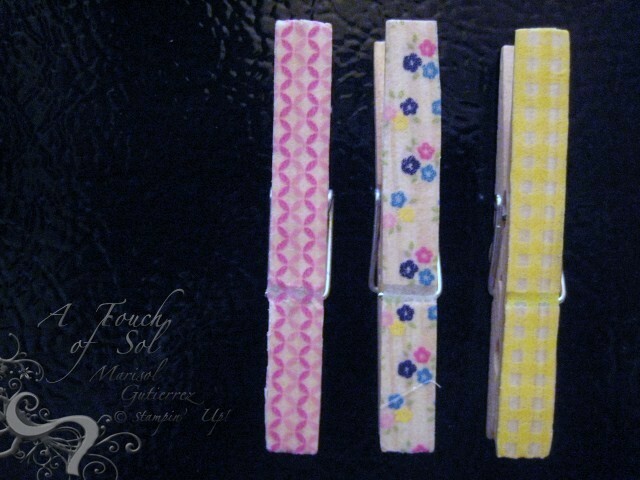 I used wooden clothespins and just added the tape on the front and magnets on the back. EASY PEASY! I do want to say that you will get better results (in my opinion) if you paint the wood white first. So above you see my clothespins that are painted white. Below you see the clothespins that are not painted. See the difference. Although the both look great. The white makes the washi tape POP! 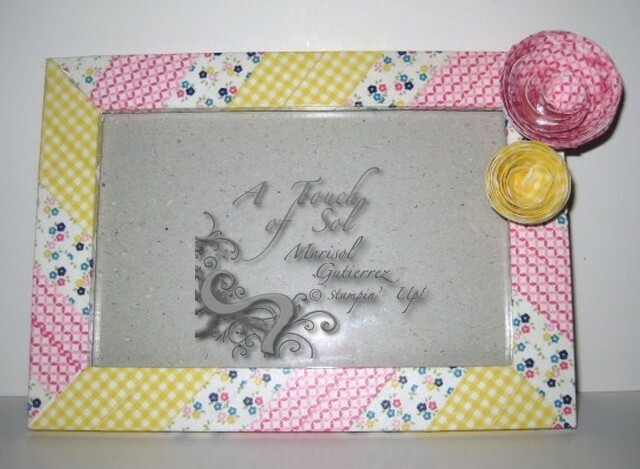 My next project is a cute frame. 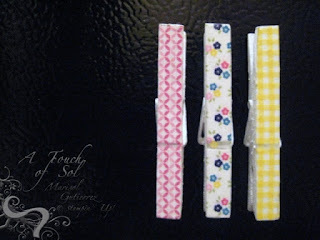 I loved adding DSP to my frames prior to washi tape but NOW love adding the washi tape too...TOO CUTE! I am going to have to do this with my Mini Crafty Chicas. YES! The flowers are washi tape too! and now here is my last project. I added washi tape to a light cover for Solimar's room. I really liked this for her and so did she. This is another project I will definitely do with my Mini Crafty Chicas. I hope that you are loving my projects and all the ones shared today. I would love you to join SUDSOL! It is absolutely AMAZING! Tons of projects, cards, tutorials and EXCLUSIVES! You will meet so many NEW demos and meet up with some OLDIES too. The wealth of knowledge and friendships I have gained have been REMARKABLE! You can join SUDSOL for a two week FREE trial membership. You won't regret your time with SUDSOL! PLEASE CLICK BELOW to JOIN SUDSOL for a FREE 2 WEEK MEMBERSHIP!